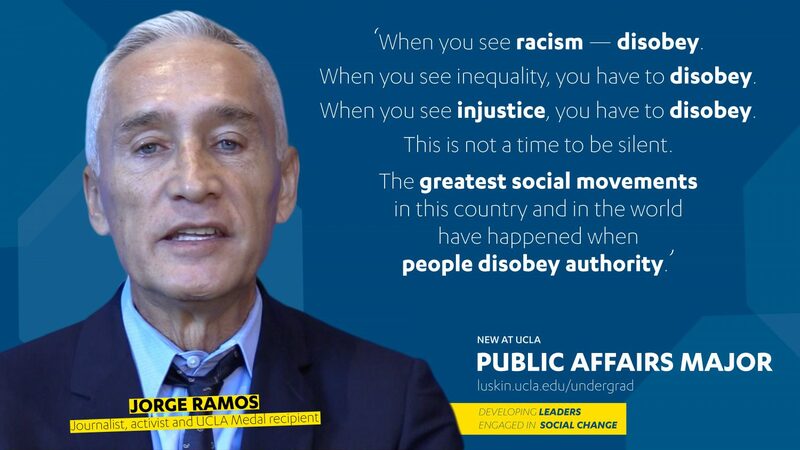 Our world is changing rapidly, creating opportunity but also inequity. Poverty, affordable housing, climate change, criminal justice reform, health, education, migration – these are among society’s most pressing issues. 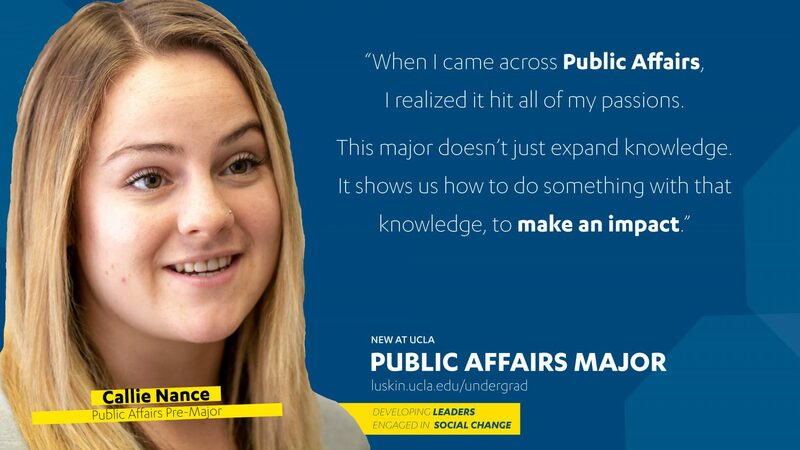 At UCLA, students are stepping up to meet these challenges head-on, and the Public Affairs Undergraduate Program gives them the skills to succeed. Students in Public Affairs learn to analyze information, use evidence for decision making, and make compelling arguments for collective action. They develop the skills needed to go into the community and apply their scholarship in nonprofit organizations, private ventures, government agencies, advocacy groups, and other settings. 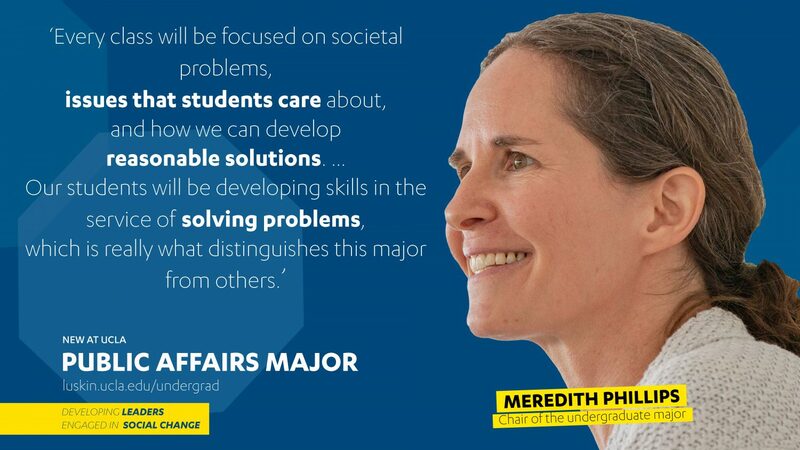 Public Affairs prepares our future leaders to immediately and effectively bring about social change. The Public Affairs Undergraduate Program provides a multidisciplinary foundation in social science theories, data collection and analysis, critical thinking, and written and oral communication. Students can delve into topics such as social movements and their policy underpinnings, microeconomics and human development, and the use of statistics to inform and persuade. This undergraduate experience prepares students for careers in the public, private, and nonprofit sectors, and for graduate study in fields such as law, public policy, social welfare, urban planning, education, or any of the social sciences. Public Affairs is also a complementary education for science or engineering students who wish to concentrate on policy issues. Public Affairs students step into the real world to put their scholarship and skills to work. Through the B.A. in Public Affairs students conduct a three-quarter-length capstone project that provides an immersive learning experience in a wide variety of settings. However they choose to structure their education, students can connect with community-based organizations, regional governments, and private companies, or pursue projects through UC’s international, Washington, D.C., or Sacramento programs. This exceptional opportunity provides first-hand experience at the intersection of governance, corporate citizenship, civil society, and grassroots activism. The world needs agents of social change whose passion to improve people’s lives is matched by the knowledge and skills to deliver results. 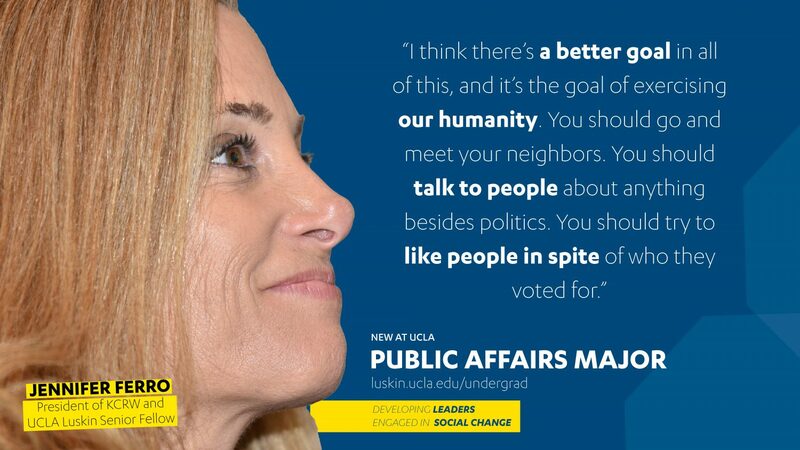 UCLA’s Luskin School of Public Affairs will help cultivate this next generation of civic-minded leaders with a new undergraduate degree, launching in the fall of 2018. The B.A. in Public Affairs offers an in-depth and engaged educational experience with a clear public service ethos. 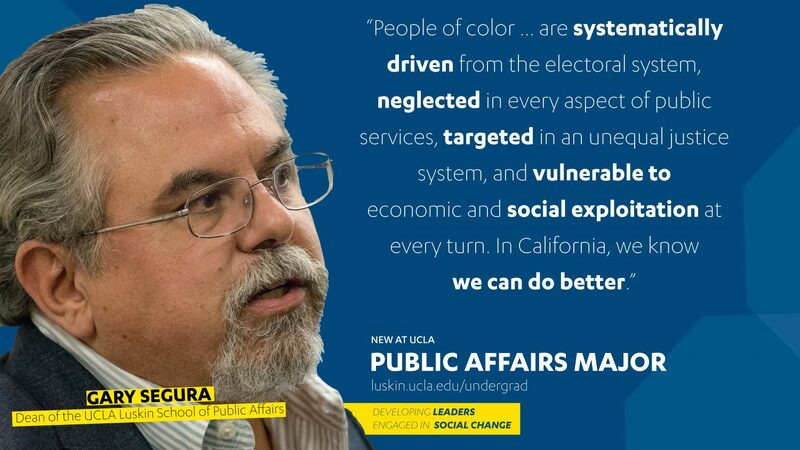 Drawing from UCLA Luskin’s expansive resources in Public Policy, Social Welfare, and Urban Planning, the major combines critical thinking, social science methodology, and experiential learning, connecting the dots between theory and action. Learn more about the major! 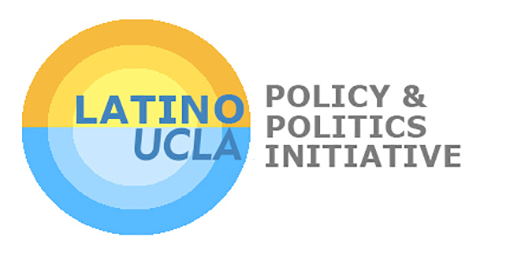 The Luskin School of Public Affairs offers three minor programs. The Minor in Public Affairs teaches students the skills of policy analysis and exposes them to the many issues facing today’s policymakers and opinion leaders. The Minor in Urban and Regional Studies offers students a means of addressing some of the most pressing issues faced by our cities and communities at the urban and regional level. The Minor in Gerontology is an interdisciplinary program which utilizes UCLA’s professional schools and College resources to create an enhanced academic experience in aging. Learn more about the minors!